My interview with the reporter was, like any good conversation, more complicated than an article could represent. I think she did a good job with the story, but conveying the complexity of homeschooling and especially unschooling is beyond the scope of a mere few pages. I stand by my quote. It is still true, although my reasons for homeschooling, my experiences with it over almost three decades, and its meaning in the context of my life and the life of my family is ever evolving. Yawar Baig seems to think that people, children included, can not make good choices without understanding the consequences of their actions. Consequences are a funny thing. How can one understand them when they’re only fully clear in hindsight? When I made the choice to homeschool my children, many around me warned of the dire consequences that could ensue. I alone couldn’t possibly provide my kids with a sufficient education, they might not get into college, they might become total weirdos. Were there consequences to my choice to homeschool? Of course. Any action has consequences, and they’re often unforeseen, and they’re usually mixed. I, like most other parents I know, made a carefully thought-out choice about the education of my children. I continued to monitor that choice, modifying it when necessary. But are kids capable of responsible choice? When Yawar Baig says choice can’t be left simply to subjective likes and dislikes, is there an implication that kids aren’t mature enough to make good choices about what they learn? Unschooling, the form of homeschooling that I chose, says children can direct their own education. For unschoolers, the world is the “classroom.” Parents and other adults are guides. When they’re needed and wanted, there are teachers, because, as I wrote in another blog post, teachers are most effective when they’re chosen by the learner. My quote from that Boston Magazine article meant that I wanted my kids to discover their interests, strengths, weaknesses, and desires for themselves, rather than internalizing the idea that they were good or bad at something because a teacher said so. It meant that I wanted their sense of self worth to come more from within than without, from their own thoughts and pursuits and imagination and observations, not from the praise or grades dispensed by a standardized system. Of course I know there are wonderful school teachers who enhance the lives of children every day. I had a few myself, but I wanted to do something different with my own family. I discovered that based on my oldest child’s experience in public kindergarten. Like many parents, I came to homeschooling because of a dissatisfaction with school. My child wasn’t failing there; she was succeeding, and that is one of the very things that disturbed me. She was one of the smart ones, the good ones. She was without a doubt the teacher’s pet. She was proud of herself, but it was also clear that she wanted that status very badly and would do whatever it took to reach and retain it. She became, as Alfie Kohn might say, extrinsically motivated. Worse, she began adopting an attitude of superiority and looked down on other children in much the same way the teacher did, something I observed when I volunteered in the classroom. There was the troublemaker who drove the teacher crazy, a five-year-old boy with an ADD diagnosis whose consistent punishment for being too loud and rowdy in the classroom was denial of recess. He would sit at the window, looking longingly at the other children playing, his inability to contain his disappointment often leading to more punishments that would be dispensed later. There was the little boy who fell smack in the middle of the teacher’s intelligence rankings. Maybe that was why the teacher tried to tell him that the special object he brought in to share on show-and-tell day wasn’t what he imagined it was. There was the little Middle Eastern girl who the teacher complained to me about for various reasons, including a bathroom accident the girl had. One day, after a gym class that parents were invited to observe, the kids were asked to line up at the drinking fountain. Being overanxious for a drink, the Middle Eastern girl ran ahead. So did my daughter. I reflexively thought to speak to my child about getting back in line, but before I could take a step, I watched as the teacher knelt down, wrapped her hands around the other girl’s shoulders, and exclaimed sternly, “You don’t do that!”, completely ignoring the fact that my daughter had also run ahead to the drinking fountain. No, I thought. I could not again leave my child every day with a person who played favorites, dispensed punishments on a regular basis, squashed a kid’s imagination, and thought a five-year-old in her care was disgusting. I would not give up that control. Initially I thought I would move for a better public school, or somehow pay for a private school, but in the process of researching what to do, I learned about homeschooling. I read an article called “The Crisis of Compulsory Schooling” by John Taylor Gatto, and I knew that homeschooling would be my path. Although I came to it because of a dissatisfaction with my child’s school, I chose it because it made sense to me, and I wanted it for my family. In other words, it was a positive, not a negative, choice. The unschooling part, the part that is integral to the issue of letting kids choose what they learn, that came later, although not too much later, after observing that the activities my daughter chose for herself were more fruitful and meaningful than any schoolwork I could assign. Yawar Baig’s article isn’t the first time I’ve encountered skepticism after expressing my thoughts that children can learn and develop just fine by choosing and pursuing their own interests. Gracy Olmsted in the American Conservative referred to “my teaching philosophy (or lack thereof)” and said my comments in a Pacific Standard interview raised questions about whether children would “sufficiently challenge their own predispositions toward laziness or ignorance without an older adult coaching and challenging them…” She and I have radically different views of children, as I don’t believe they have predispositions toward laziness or ignorance, but her assumptions that older adults would be absent as coaches, sources of inspiration, or influencers of other kinds are just wrong. My response to her was a post I called Unschooling: they just don’t get it. Yawar Baig’s article, although addressing homeschooling in general, gives me the same feeling. 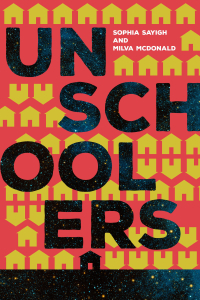 In fairness, unschooling is a pretty difficult concept to get without actually doing it, but it’s important that we keep talking so that one day, people look at homeschooling and unschooling as just another educational option. As I continue to encounter misunderstandings, misinformation, and plain ignorance about unschooling (and homeschooling), I’ve come to the conclusion that trying to relay the experience in words is like trying to describe certain scents or flavors. Sometimes you just have to experience it firsthand.